In 2006, before Humax's HDCI-5000 was born, the HDCI-2000 was one of an elite breed. It wasn't the first FTA HD satellite receiver, but the 2000 could accommodate the cutting-edge H.264 and DVB-S2 standards. You could use it to watch the BBC HD channel and also tune into the emerging European HD channels. Courtesy of its CI slots, the 2000 also made provision for European hi-def pay-TV. The HDCI-5000 sells for about £100 less than its predecessor. The midi-sized 5000 is, alas, nowhere near as svelte in appearance, and the 2000's fluorescent display has been downsized to four green LED digits. In addition, you'll only find a single CI slot under the drop-down flap – the 2000 had two. Front panel controls are minimal. There are no menu buttons, and so the blandly styled but solid handset is essential. And you'll need a PC to read the manual CD-ROM. You get the (single-tuner) LNB input and output, component output, twin Scarts and optical digital output of the 2000, as well as its composite and analogue-audio socketry. Among these connectors is a switch that forces you to choose between component and RGB Scart. Where the 5000 scores over the 2000 is in its provision of Ethernet connectivity. This terminal, which has so much potential, is described in the manual as a 'service port'. We hope Humax will do something useful with it in time. The 2000's RS232 port has gone AWOL. Humax has instead hedged its bets on the USB Host port – described in the manual as 'connecting to the USB memory or external HDD'. So can PVR functionality can be added? Not at the moment. The USB port (also on the 2000) is currently provided for backing-up or restoring channel databases. No mention has been made of firmware upgrades here; these are (or will be) available over the air. Unusually, the 5000 is compatible with SCD (Single Cable Distribution), a clever band-shifting system that allows up to eight receivers to be fed from a purpose-designed LNB via a single cable. SCD is one of the 'antenna type' options of the receiver's friendly 'setup wizard'. This also takes you through language, time-zone, default channel lists, dish configuration, initial searching and display configuration. The wizard only covers simple DiSEqC switchboxes; further setup is necessary for motorised dishes. This wipes any previous searches from its memory; motorised dish users should cancel the search, let the wizard run its course and engage manual setup. Which takes us to the slick and beautifully designed menu system, the options of which are divided among four groups. 'Preferences' looks after languages, time/ date and AV settings (such as Scart output, aspect-ratio, display mode and – if you're not using HDMI – lip sync correction). From 'edit channels', you can delete, move, rename and restore channels. There's also the ability to import/export channel lists to/from USB – although we couldn't get this to work. The third option is 'installation', and it's from here that your motorised dish is configured. From its 'edit satellite data' option, the satellites you can receive can be 'activated'. The DiSEqC positioner, which caters for 1.2 or USALS, is excellent – not only can you call on any positions residing in your mount's memory, but you have complete control over movement – continuous or (variable) steps in either direction. There's also a 'recalculate' function, and dish-limit setting. You can search all transponders of the selected satellite, or just focus on one – it's also easy to define and store a new transponder for future searches. This is the closest the 5000 gets to manual searching. Parameters here are the expected frequency, polarity, symbol rate, modulation type (DVB-S or DVB-S2) and FEC. Disappointingly, no provision for PID entry has been made and blind-search is absent. With a motorised dish searching couldn't be easier. You choose the satellite you want, the dish moves to the appropriate position, then you specify the terms of the search (free and/or encrypted, radio and/or TV) and off it goes. What a shame that automatic multi-satellite searches are not allowed. Other installation menu options cover over-the-air firmware updates and a master reset. Finally, we have the 'system' menu, which reveals receiver and CI module status. Humax receivers traditionally score well in navigation terms, and the 5000 is no exception, owing to its fast channel-change and sensible use of the handset's coloured fast-text keys. Channels can be sorted alphabetically, or by conditional-access status. Another press of a button and all available hi-def channels are listed. It's also easy to list all of the channels on a specific satellite. A pop-up menu activated by a press of the 'opt+' button allows you to delete, rename or lock channels. They can also be placed into one of the five favourites lists, each of which can be renamed. It's well designed. Then there's 'i-Bar', Humax's name for the channel-information pop-up. 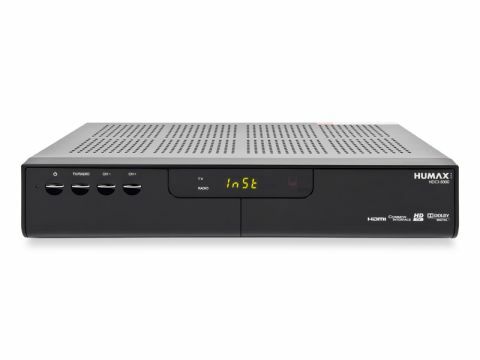 This gives you channel/programme name, time/date, a programme-progress bar and HD/encryption status as well as signal strength and quality. The EPG, which supports now-and-next and 7-day schedules, also employs the coloured keys to good effect. The default mode relies on the traditional grid format, which can simultaneously accommodate up to seven channels, but there's also a single-channel list view. Owners of VCRs or DVD recorders can schedule programmes so that the receiver changes channel at the appropriate time. A useful 'quick browse' will let you hop around the schedules in speedy increments. Then there's the three-step 'zoom', but the icing on the cake is a 'find' function. Enter a keyword, and programmes containing it are listed. To quicken the search a genre, day and approximate time frame can be chosen. The 5000 has few gimmicks. There's no multimedia playback or 'picture freeze', and this receiver is the first we've come across in years not to include a Tetris clone or any other games. But you can arrange for the receiver to turn itself on at a specified time, switch to a channel of your choosing and then shut down again. Rather more useful are two buttons marked 'v.format' and 'wide'. The first cycles through the various component/HDMI output modes (576i/576p/720p/1080i), while the second either expands the picture to fit the screen or displays in letterbox format. This is particularly useful for HDMI because not all displays give you control over aspect ratio. If you're viewing a standard-def channel it's upscaled if a HD output mode has been selected. Other features include teletext, subtitles and soundtrack selection (Dolby is supported). In performance terms, the 5000 scores highly. Searching is commendably fast; more than 1,700 Hot Bird TV and radio services were found in under four minutes by a tuner of above-average sensitivity. While searching is fast, this receiver's inability to accept PIDs or conduct multi-satellite scans coupled with the lack of blind search will disappoint the enthusiast. The 5000 found most hi-def services – BBC HD, Eins Festival and Luxe HD included – but ITV HD proved to be beyond its capabilities. A future firmware update – our test receiver had a very early version – will apparently address this. Both picture and sound quality were first-rate, hi-def channels standing out with a rich visual texture and vivid, natural colour. By any standards, well-encoded standard-def programming fares well too, even with upscaling engaged. Sound quality, whether radio or TV, is detailed and clear. If you're after a reasonably priced HD receiver and aren't bothered about the bells or whistles, the HDCI- 5000 is worth considering. We hope that improved firmware will fix some of our criticisms, especially the unused Ethernet port, underused USB, limited search capabilities and ITV HD incompatibility.